The Budding Ideas Glocally for 2050 project, also known as BIG2050, aims to demonstrate that not only is sustainable living possible today, it will be also be considerably more so in the year 2050. 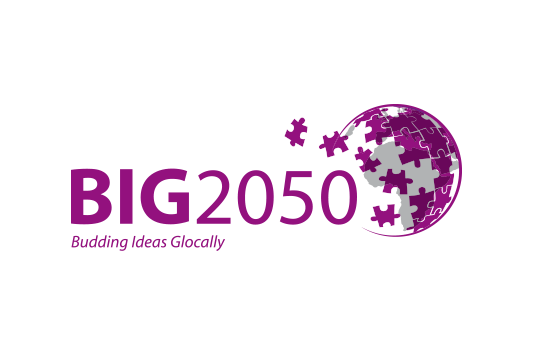 By analysing consumption patterns and how these patterns influence lifestyles in five different countries, BIG 2050 seeks to identify a range of possibilities, based on observed lifestyle practices, for future sustainable solutions. Using research as a basis, the project will develop a roadmap to bring together trends in sustainable consumption and production as well as different visions of the “good life” in the five target countries. The BIG2050 project’s ultimate goal is to build new partnerships to facilitate a shift away from current unsustainable production and consumption practices toward mechanisms that support behavioural change, information flows, engagement, and other actions in order to support sustainable lifestyles. Multi-stakeholder workstudios were held in 2012 and 2013 in China, Colombia, Ghana, Germany and the Philippines. The first workstudio From low-carbon 2050 to today was held in Wuxi, China, on October 24, 2012. A key finding during this event was that Chinese consumer behaviour can be shifted if proper mechanisms are in place. Information on this and other findings are available in the workstudio report. The second workstudio, Collaborating towards sustainable lifestyles through innovation, was held in Bogota, Colombia, on December 3, 2012. Issues from peace-making processes and the integration of finance to education,social responsibility and value chains were discussed. A workstudio report for this event is also available here. The third workstudio, Innovation for Competitiveness towards Sustainable Lifestyles, took place in Manila, the Philippines on March 21, 2013. The event brought to light relevant issues such as the need to make education a pivotal strategy for investing in the Filipino people and to recognise the advancement and protection of public health, among other findings available at the workstudio report. The fourth workstudio, Collaboration and Sustainability: A Multi-Sectoral Path for Growth, was held in Accra, Ghana on June 13, 2013. A crucial finding was the relevance and need of transparent governance structures as participants voiced these structures were one of the biggest opportunities for sustainable growth. The fifth and last workstudio, Collaboration for Sustainable Lifestyles through business and social innovation, took place in Berlin, Germany, in early November.,Its ambitious agenda brought together over 60 participants from all over Europe, making this a regional workstudio. The CSCP implemented the Budding Ideas Glocally for 2050 project with generous funding support from the German Federal Ministry for Economic Cooperation and Development.